The solid-state drive (SSD) market is enjoying a bit of a refresh this week, with no fewer than three companies announcing new product families. Corsair, to start, has officially launches the Force GS Series, which combine an LSI SandForce SF-2281 controller with toggle-DDR MAND flash for improved performance compared to the current-generation Force family. Boasting a SATA 6.0Gb/s interface, TRIM support, and maximum 4K random write of 90,000 input/output operations per second (IOPS) in the smaller capacities and 50,000 IOPS in the larger, the drivers are certainly impressive. In testing, Corsiar claims the new Force GS family can hit 555MB/s read speeds in 180GB, 240GB and 360GB capacities, or 540MB/s if you're plumping for the top-end 480GB model. Write speeds of 525MB/s are possible on the 180GB and 240GB units, dropping to 530MB/s on the 360GB and then taking a nosedive to 455MB/s on the 480GB. Formal pricing has yet to be confirmed, but Scan is taking pre-orders on the 180GB at £147.82, £189.89 for the 240GB, £275.23 for the 360GB and £378.58 for the 480GB. 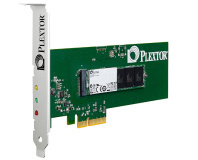 Next on the list is Plextor, which has announced the M5 Series. Based on the same Marvell 88SS9174 controller as the M3 family, the M5s will be available in 64GB, 128GB, 256GB and 512GB capacities at launch. Interestingly, Plextor has made the decision to switch from the Toshiba flash chips used in the M3 Series to Micron-manufactured components, although it hasn't indicated the reason for the move. 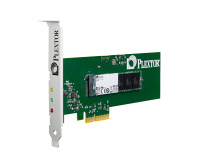 According to Plextor, the 256GB model will reach speeds of 532.3MB/s read and 403MB/s write for sequential access, with 512K random reads hitting 410.2MB/s and writes 405.4MB/s. Pricing for the devices has yet to be confirmed. 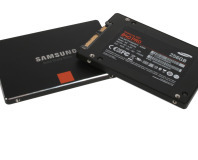 Finally, Apacer has announced possibly the world's most convoluted product naming convention yet: large-capacity multi-level cell (MLC) wide-temperature SSDs with CF and SD interfaces. Definitely not just a standard solid-state SecureDigital or CompactFlash card, Apacer assures us, the devices are designed to be as stable as possible across a temperature range of -40°C to 85°C. The CompactFlash version is capable of 55MB/s read and 20MB/s write performance, with the SecureDigital trailing at 19MB/s read and 14MB/s write. The CF SSD will be available in 8GB, 16GB and 32GB flavours, while the SD version will be available in 4GB, 8GB, 16GB and 32GB models. Both feature error correcting capabilities and support for the ATA Secure Erase command. Designed for industrial use, Apacer has not released pricing for its they're-SSDs-honest products - but expect to pay a premium over traditional solid-state CF and SD cards.